^ "Distance between Stevenage SG1, UK and Charing Cross (UK)". Distancecalculator.globefeed.com. Retrieved 10 July 2018. ^ "Minister performs topping out ceremony". 14 July 2011. Retrieved 20 November 2011. ^ "Hertsdirect.org: Stevenage Central Library". Hertfordshire County Council. Retrieved 22 May 2013. ^ "Hertsdirect.org: Stevenage Old Town Library". 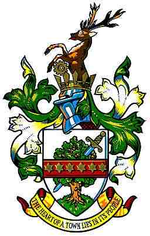 Hertfordshire County Council. Retrieved 22 May 2013. ^ "About us". TrustyBus. 21 January 2016. Retrieved 14 January 2019. ^ "Almond Hill Junior". almondhill.herts.sch.uk. Retrieved 28 December 2015. ^ "Ashtree Primary School & Nursery". ashtree.herts.sch.uk. Retrieved 28 December 2015. ^ "Bedwell Primary School & Nursery". bedwell.herts.sch.uk. Retrieved 28 December 2015. ^ "Broom Barns Community Primary". broombarns.herts.sch.uk. Retrieved 28 December 2015. ^ "Camps Hill Community Primary". campshill.herts.sch.uk. Retrieved 28 December 2015. ^ "Fairlands Primary School & Nursery". fairlands.herts.sch.uk. Retrieved 28 December 2015. ^ "Featherstone Wood Primary School & Nursery". featherstonewood.herts.sch.uk. Retrieved 28 December 2015. ^ "Giles Junior". gilesjm.herts.sch.uk. Retrieved 28 December 2015. ^ "Giles Nursery & Infants". gilesnurseryandinfants.co.uk. Retrieved 28 December 2015. ^ "Letchmore Infants' & Nursery". letchmore.herts.sch.uk. Retrieved 28 December 2015. ^ "The Leys Primary & Nursery". leys.herts.sch.uk. Retrieved 28 December 2015. ^ "Lodge Farm Primary". lodgefarm.herts.sch.uk. Retrieved 28 December 2015. ^ "Longmeadow Primary". longmeadow.herts.sch.uk. Retrieved 28 December 2015. ^ "Martins Wood Primary". martinswood.herts.sch.uk. Retrieved 28 December 2015. ^ "Peartree Spring Primary". peartreespringjm.herts.sch.uk. Retrieved 28 December 2015. ^ "Roebuck Primary School & Nursery". roebuck.herts.sch.uk. Retrieved 28 December 2015. ^ "Shephalbury Park Primary". shephalburypark.herts.sch.uk. Retrieved 28 December 2015. ^ "St Margaret Clitherow Roman Catholic Primary". clitherow.herts.sch.uk. Retrieved 28 December 2015. ^ "St Nicholas C of E Primary School & Nursery". stnicholas120.herts.sch.uk. Retrieved 28 December 2015. ^ "St Vincent de Paul Catholic Primary". stvincent.herts.sch.uk. Retrieved 28 December 2015. ^ "Trotts Hill Primary & Nursery". trottshill.herts.sch.uk. Retrieved 28 December 2015. ^ "Woolenwick Infant & Nursery". woolenwickinfants.herts.sch.uk. Retrieved 28 December 2015. ^ "Woolenwick JM". woolenwickjm.herts.sch.uk. Retrieved 28 December 2015. ^ "Larwood Primary". larwood.herts.sch.uk. Retrieved 28 December 2015. ^ "Lonsdale School". lonsdale.herts.sch.uk. Retrieved 28 December 2015. ^ "Greenside School". greenside.herts.sch.uk. Retrieved 28 December 2015. ^ "The Valley Secondary". thevalley.herts.sch.uk. Retrieved 28 December 2015. ^ "Barnwell School". barnwellschool.co.uk. Retrieved 28 December 2015. ^ "The Barclay School". barclayschool.co.uk. Retrieved 28 December 2015. ^ "The John Henry Newman School". jhn.hert.sch.uk. Retrieved 28 December 2015. ^ "marriotts.herts.sch.uk/academy". marriotts.herts.sch.uk. Retrieved 28 December 2015. ^ "nobel.herts.sch.uk". nobel.herts.sch.uk. Retrieved 26 April 2012. ^ "The Thomas Alleyne Academy". tas.herts.sch.uk. Retrieved 28 December 2015. ^ "North Hertfordshire College". nhc.ac.uk. Retrieved 28 December 2015. ^ "List of Primary Schools in Hertfordshire". Hertfordshire County Council. Retrieved 28 December 2015. ^ "stevenagechurches.org.uk". stevenagechurches.org.uk. Retrieved 26 April 2012. ^ "Stevenage Interfaith Forum". Stevenage Interfaith Forum. Retrieved 19 May 2018. ^ "All Saints Church". allsaints-stevenage.org.uk. Retrieved 18 December 2015. ^ "Bunyan Baptist Church". bunyan.org.uk. Retrieved 18 December 2015. ^ "Christ the King Church". The Church of England. Retrieved 18 December 2015. ^ "City of David Church". rccgstevenage.org.uk. Retrieved 18 December 2015. ^ "St George Cathedral". The Coptic Orthodox Church Centre UK. Retrieved 19 May 2018. ^ "Elim Pentecostal Church". Churches Together in Stevenage. Retrieved 18 December 2015. ^ "Grace Community Church". grace-community-church.org.uk. Retrieved 18 December 2015. ^ "Great Ashby Community Church". greatashbycc.org.uk. Retrieved 18 December 2015. ^ "High Street Methodist Church". Churchest Together in Stevenage. Retrieved 18 December 2015. ^ "Holy Trinity Church". The Church of England. Retrieved 18 December 2015. ^ "Kingdom Hall of Jehovah's Witnesses". Archant Hertfordshire. 11 September 2015. Retrieved 18 December 2015. ^ "Longmeadow Evangelical Church". 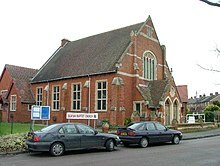 longmeadow-church.org.uk. Retrieved 18 December 2015. ^ "Religious Society of Friends". Churches Together in Stevenage. Retrieved 18 December 2015. ^ "Oak Church Stevenage". Oak Church Stevenage. Retrieved 10 July 2018. ^ "Roman Catholic Church of St Hilda". Diocese of Westminster. Retrieved 18 December 2015. ^ "Roman Catholic Church of St Joseph". Diocese of Westminster. Retrieved 18 December 2015. ^ "Roman Catholic Church of the Transfiguration". Diocese of Westminster. Retrieved 18 December 2015. ^ "Salvation Army Stevenage". The Salvation Army. Retrieved 18 December 2015. ^ "St Andrew & St George Church". The Church of England. Retrieved 18 December 2015. ^ "Seventh Day Adventist Church". Churches Together in Stevenage. Retrieved 18 December 2015. ^ "Stevenage Liberal Syngagogue". stevenageliberalsynagogue.org.uk. Retrieved 18 December 2015. ^ "Stevenage Muslim Community Centre". smcc786.co.uk. Retrieved 18 December 2015. ^ "St Hugh & St John Church". The Church of England. Retrieved 18 December 2015. ^ "St Mary's Church". stmaryshephall.co.uk. Retrieved 18 December 2015. ^ "St Nicholas Church". saintnicholaschurch.org.uk. Retrieved 18 December 2015. ^ "St Paul's Church". Churches Together in Stevenage. Retrieved 18 December 2015. ^ "St Peter's Church". stpetersweb.co.uk. Retrieved 18 December 2015. ^ "Stevenage Vineyard Fellowship". stevenage-vineyard.co.uk. Retrieved 18 December 2015. ^ "Find A Meetinghouse Near You". Retrieved 24 February 2017. ^ "United Reformed Church". stevenageurc.org.uk. Retrieved 18 December 2015. 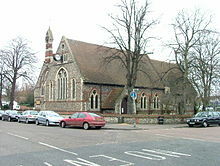 ^ "Whomerley Spiritual Church & Centre". whomerleycentre.weebly.com. Retrieved 18 December 2015.